There’s some information about the new beta Source Control Integration feature over at my blog. I’ve talked before about using Git with VBA and also about the importance of using source control and other tools for our work. Truthfully though, using source control with VBA is still hard. This is mostly because getting the code modules into and out of the VB Project is hard, and harder to do right. Well, you may have heard that there’s a new duck in town. It’s taken me about 6 months of spare time, but Rubberduck v1.4 not only has a source control COM library that you can use right in VBA to work with Git VBA repositories, but you can also now branch, commit, pull, push, and merge right from inside of the editor. There’s a new duck in town! The past few months have been tough. We were facing some serious ANTLR grammar bugs, and our identifier resolver had even more serious bugs, which meant false positives in code inspections, a rename refactoring that wouldn’t always rename all references, and a StackOverflowException if you were unlucky… which blew up Rubberduck, the VBE, and the Office host app with it, without warning. That’s why 1.3 remained a “pre-release”. Rubberduck 1.4 has none of these issues. Oh, our ANTLR grammar is still far from perfect (line numbers, and “precompiler” #IF statements come to mind) – but a number of bugs were fixed, and the resolver was completely rewritten. It’s not as perfect as we’d like it to be, but it correctly resolved everything we threw at it, without a single exception. Reorder Parameters in a procedure, and automatically adjust all call sites. Remove Parameters from a procedure’s signature, and automatically adjust all call sites. Rename can be used from the Project Explorer, Code Pane or Form Designer context menus, as well as from the Code Explorer to rename a project, a component (form, module, class), a procedure, variable, line label, …anything. This completely eliminates all excuses to keep meaningless identifiers in your code. The Code Explorer was already a nice feature in 1.2, but Rubberduck 1.4 takes navigation to a whole new level. Find Symbol lets you search for anything – and go to its declaration. Find all references displays all call sites of any identifier. Go to implementation lets you navigate implementations of an interface or interface members. Rubberduck considers any class referenced by an Implements statement as an interface. One cool thing is that we’ve created declarations for pretty much everything in the Standard VBA library, so you can use find all references to list all usages of, say, MsgBox, or Err.Raise. That’s right. We’ve talked about it for a while. Well, it’s here. Integrated source control, right there in the VBE. Commit, push, pull, merge, branch, to and from local or remote repositories on GitHub. 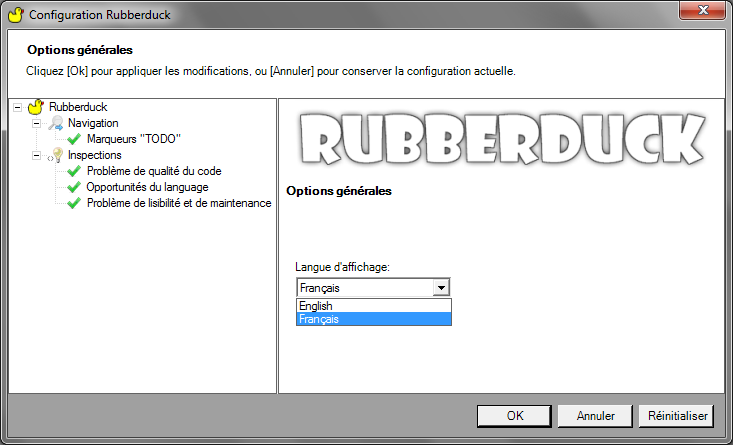 If you’ve never used a previous version of Rubberduck, now is the time. Every VBA programmer needs a Rubberduck. Next release rocks. Like, if you’re running 1.22, you’re not going to believe everything that’s coming at you in 1.4 – and if you’re running 1.3x, …you’re not going to believe it either. …we are proud to announce localization in French and Swedish, and a German translation is under way. More announcements to come, stay tuned!